There was a great turnout for the Oakland Urban Paths walk in Montclair last Saturday, which focused on the history of the Sacramento Northern Railway, the highway that wasn’t built, and the stairs of Thornhill. Chris Kidd and I co-lead the walk, and were joined by 40 people and half a dozen dogs. We met near the park in Montclair Village, and started by viewing the two large concrete walls nearby on Mountain Boulevard. Many residents don’t realize those are left from the days when the Sacramento Northern Railway ran behind the village and a railroad bridge passed over Mountain Boulevard. We walked through Montclair Village to view a building that was originally for the Realty Syndicate, the real estate and transit business owned by F.M. “Borax” Smith and Frank Havens. The headquarters of the Realty Syndicate was at 1440 Broadway, an impressive building that is still there, and currently houses Oaklandish and other businesses. Then it was a short but steep climb up to the railroad trail. This wide, level trail follows the old Sacramento Northern Railway right of way, which makes it ideal for walking and biking—it’s part of my bike route home. My grandfather worked for the Sacramento Northern, so it has a personal connection for me as well. Along the trail there are various interpretive signs about local history installed by Eagle scout Daniel Levy. We doubled back and took some stairs up the hill to Gaspar Drive. Like many of the stairs in Oakland, they’re unmarked, and it’s very easy to walk past them even if you’re looking for them. 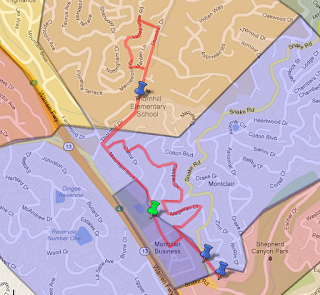 We traversed our way along Gaspar and Colton and Diaz Place, a short cul-de-sac, then went down some more unmarked stairs to Cabot and then back down to Mountain Blvd. From there, Chris took the lead, and we headed up Thornhill Drive along the upper reaches of Temescal Creek. Geographically, we’d crossed over from the Sausal Creek watershed which goes through East Oakland, to the Temescal Creek watershed which goes through Oakland and meets the bay in Emeryville. Yet another way of looking at the question of where is East Oakland? We took a short break at a coffee shop on Thornhill. After serving the sudden flood of customers, the owner came out to learn more about the OUP walk and to greet some of the two- and four-legged participants. Then it was time for some serious stair climbing. While the stairs we’d climbed near the railroad trail were concrete, the stairs off Thornhill are mostly wood. In part because the hillside is steeper in places, and the wooden stairs can more easily match that. 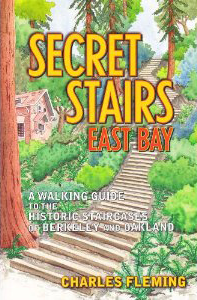 Some of the stairs in this part of the walk I’d found while test-walking routes for Secret Stairs of the East Bay. 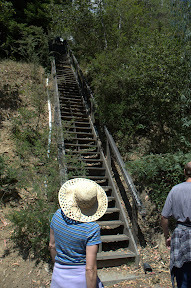 We didn’t climb all the way to the top, but we pointed out an even steeper set of stairs that continued up the hill. While most of us then headed back down towards Thornhill, a few intrepid souls continued on up the stairs. That’s dedication! Wondering about the Syndicate Building (6208 La Salle, now painted bright candy pink.) Is this an historically important building? Was it built to serve the proposed Montclair syndicate rail line? Erika Mailman’s “Oakland Hills” book labels it in a c.1930 picture as a “Realty Syndicate Garage”, presumably with the garage entrances on the Mountain Blvd. side. I don’t know about rail line plans, as at that point Montclair was already well served by the Sacramento Northern Railway.